We are one of the leading manufacturer and supplier of Leeb Hardness Tester TH170. We obligated to meet the quality standards as per the customer demand. 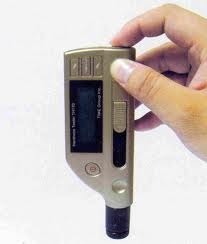 It is a small, light and portable tester. It is most suitable for testing of heavy, big or outdoor mental parts. Model:-MHT 370/TH110 (Brand :- Samsonic). Wide measuring range. Based on the principal of Leeb hardness testing theory. 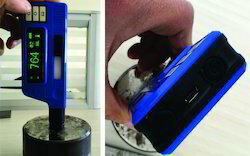 It can measure the Leeb hardness of all metallic materials. Large screen 3 inch, showing all function and parameters. Test at any angle, even upside down. Direct display of hardness scales HRB,HRC,HV,HB,HS,HL. Date, impact direction, impact times ,material and hardness scale etc. Battery information indicates the rest capacity of the battery and the charge status. Software to connect with PC via USB port. Thermal printer integrated, convenient for in field printing. Auto power off to save energy. corrosive medium and heavy dust. Insert the tapered end of the standard test bar after cleaning into the space provided between the ball and the plunger and slide it further beyond the tapered position. The test bat will thus be firmly gripped between the ball and the plunger pressed by a spring. The specimen to be tested be properly ground or filed and polished at the surface where it is to be tested to ensure accurate readings, With standard test bar inserted place the tester vertically on the specimen such that the ball touches the polished surface. Give a blow on the top of the plunger, with a hammer. The blow should not be very hard and should as vertical as possible. The blow will cause two indentations, one on the standard test bar and the other on the specimen. The diameters of these two indentations should be measured accurately with magnifier having, lease count of 0.1 mm provided with the machine. If the indentations so obtained are slightly elliptical, average diameter should be found out. The distance between the centers of any two indentations on standard test bar should be less than 15mm. If the bar is fully utilized it has to be replaced. The limiting indentation diameter on the standard test bar is 4.2mm. 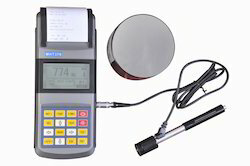 We are operating as the successful distributor and trader of Poldi Type Metal Hardness Tester. The offered product is used for testing the hardness of ferrous and non ferrous metals. 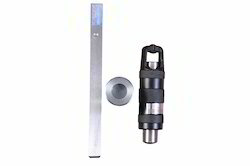 It is dimensionally accurate and has been sourced from a reliable vendor base for maintaining quality. Our product range is regarded for being flawless, is supplied within the stipulated time period and also is in tune with the international standards. "Poldi" type impact hardness tester for metals (ferrous as well as nonferrous) with 10 mm Brinell ball indentor and with Magnifiscope, supplied with instruction manual in four languages Viz., English, German, Portuguese ,Russian. 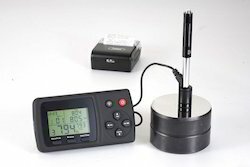 The samsonic pencil hardness tester is used for verifying the hardness values of graphite pencils to evaluate coating hardness. The Test Block is so designed to ensure that the cylindrical pencil lead is maintained at a constant angle of 45° and exerts a force of 7.5N approx. The pencil lead, prepared beforehand using the special sharpener and abrasive paper, is provided with the instrument and pushed over the smooth, flat coated surface. The lowest hardness value of the pencil which marks the coating determines the coating’s hardness rating. The instrument is supplied complete with set of hardness pencils (14/17/19 pencils), positioning block(optional), x1 pencil sharpener, abrasive paper set, carry case and operating instructions can be used in accordance with ASTM D 3363, IS 101 (part 5), BS 3900-E19, ISO 15184 etc. The pencil hardness test, also referred to as the Wolff-Wilborn test, uses the varying hardness values of graphite pencils to evaluate a coating’s hardness. 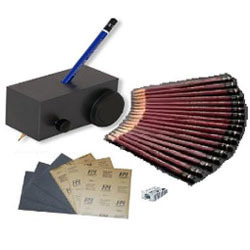 Model: PHT-S12 supplied complete with Indian make Scratching tool of fixed pressure of 7.5N/750gms and 45 fixed angle, STAEDTLER German make Pencils in set of 12 pencils 6B to 4H in original packing, set of 12 Pencils includes – 6B, 5B, 4B, 3B, 2B, B, HB, F, H, 2H, 3H and 4H, 1 no. 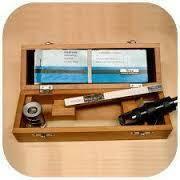 STAEDTLER German make sharpener, set of Abrasive Paper and operation manual. The pencil hardness test, also referred to as the Wolff-Wilborn test, uses the varying hardness values of graphite pencils to evaluate a coating's hardness. Model: PHT-S19 supplied complete with Indian make Scratching tool of fixed pressure of 7.5N/750gms and 45 fixed angle, STAEDTLER German make Pencils in set of 19 pencils 8B to 6H in original packing, set of 19 Pencils includes – 8B, 7B, 6B, 6B, 5B, 4B, 4B, 3B, 2B, 2B, B, HB, F, H, 2H, 3H, 4H, 5H, and 6H, 1 no. STAEDTLER German make sharpener, set of abrasive paper and operation manual. 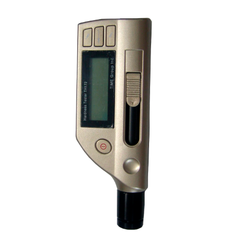 The device operates with both UCI (Ultrasonic Contact Impedance) and Leeb (dynamic) probes. User get the benefits of two methods of measurement – it is the maximum that can be obtained from portable hardness tester. The ultrasonic contact impedance (UCI) probe is used for measuring the hardness of small items, objects with a thin wall, complex form, and to measure the hardness of surface hardened layers. Universal portable hardness tester T-UD3 use the UCI method for the hardness measuring, which is standardized according to ASTM A 1038. 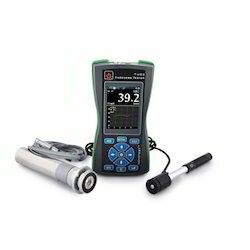 This method allows user to measure very fast and easy: install the probe on tested object, press on the probe with required effort and after that save the results of the hardness value, which are showed on the display of the device. 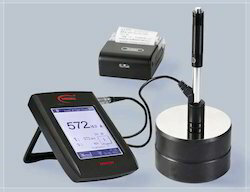 Diamond indenter has a small size that allows user to measure hardness value of all samples, which are thicker than 1 mm. Hardness tester T-UD3 also use a dynamic method of the hardness measuring – Leeb method, which is standardized according to ASTM A596. This method allows user to measure very fast and easy: install the probe, press on the probe to recharge spring, press the button on the top of the probe to make test and after that save the results of the hardness value, which are showed on the display of the device. This method is used for measuring the hardness value of non-ferrous metals, cast iron, coarse-grained materials, massive products etc. (with weigh more than 5 kg or thicker than 10 mm) also this method perfectly complements the UCI method of hardness measuring. Hardness tester T-UD3 makes automatic calculation of the hardness of a wide range of materials – steel, stainless steel, cast iron, bronze, aluminum, so that we can say that combined hardness testers is the most universal, which is needn’t in recalibration, and fully ready for operation after “getting out of the box”. Ultrasonic (UCI) probe – pre-calibrated for steel. Dynamic (Leeb) pre-calibrated for steel, alloy steel, cast iron, stainless steel, aluminum, bronze, brass, copper. Additional custom materials for calibration. Data display Load applied/contact (UCI), Angle (Leeb), Single test result, Max, Min, Average of tests, Number of tests, Deviation, Var. coeff, Histogram, Signal and Smart Mode (Filter of incorrect measurements). Operating environment Temperature:-20°C~40°C; Humidity: 30%~80%R.H. Battery life Approx. 10 hours. Looking for Hardness Testing Machine ?